Know all about Iolite history, origin, prices, quality and color, and all the information is written by a Graduate Gemologist from GIA, California. This stone quite resembles Tanzanite. Sometimes even amateur gemstone business men get confused among Sapphire, Tanzanite and Iolite because all three come in the same color, and transparency and share the same optical property of Pleochroism. Tanzanite was thought to be a Cordierite in the beginning and ‘Iolite’ is the trade name for Cordierite. 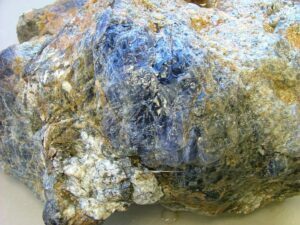 Iolite is silicate material of aluminum, iron and magnesium. As we detailed in our Tanzanite product page about Pleochroism, a cutter has the same challenge to cut this stone in the best way. Iolite’s history is not new. When Leif Eriksson and the other famous adventurers, ventured out into the huge Atlantic Ocean, they used to use Iolite to find their position. Are you wondering how? They used to keep thin pieces as a polarizing filter and used this to determine the exact position of the sun and guide their way back to the starting point. Iolite has different hue colors from the sides so they used this optical property. The world’s biggest Iolite – The world’s largest iolite crystal was found in south of Palmer Creek, in Grizzly Creek. Approx weight for the crystal is 24,000 carats. Iolite has two features – A violet hue derived from presence of iron and its Pleochroism optical property which can be seen easily by the eyes with no need of any magnifying loop. It is blue-gray, blue-purple and dark blue and somewhere colorless, which shows when you see it from different sides. We explained in our Tanzanite product page about the cutter’s challenge and when he/she cuts this stone, its the same way. The cutter tries their best to cut in a way that the grayish, yellowish, colorless and brownish hues don’t show through the crown or face. When you see a rough of Iolite as above, then it is very difficult to analyze the side for the best color and only experts know this. We have an 18 years experienced team for this Iolite gemstone cutting job. When we talk about the treatment then Iolite is a completely natural stone without any enhancement. Iolite is mined in Mozambique, India, Sri Lanka and Brazil and other countries. A cordierite is typically an opaque gemstone and this quality is used in cabochons, while fine gem-quality Iolite comes in a transparent to a translucent quality. The cutting of Faceted Iolite Gemstones matters a lot, if its a shallow cut then it shows “window” and a deep cut reduces the transparency, so it should be cut perfectly in order to get a perfect transparency and color. It has been a little difficult task for a normal person to distinguish among Tanzanite, Iolite and the other transparent blue stones. There is a simple trick, when you rotate Iolite then it gives a grey to colorless tint/hue. On the other hand Tanzanite gives a purple hue when you rotate it. Mainly Iolite is cut in faceted stones because of transparency but the slight or weak colored material or “SI material” is used in cabochons. You can find 5 carats and below of Iolite stones without struggling hard but over 5 carat sizes are difficult to find and generally it ranges up to 10 carats. We have all regular to free size Iolite faceted and cabochons stones. Iolite Round Cabochons from our stock. Tanzanite and Sapphire quite resembles Iolite. The only way to identify the correct stone is the hue. First if the color is Sapphire Blue then it is Blue Sapphire, or if its violet-like blue then it is Tanzanite and if it is a light-blue with grey and colorless at some point, then it is Iolite. If we compare based on hardness then it is harder then Tanzanite and softer than Sapphire. A good quality Tanzanite comes in a vivid blue that color you cannot get in Iolite and Blue Sapphire. Another way is to see the size of the stone because in a vivid blue color, it is difficult to get a piece of Blue Sapphire and Iolite above 5 carats. Over 5 carats, Iolite and also Blue Sapphire come in included quality and Tanzanite can be found in clear quality easily. Chemical properties and the Properties of Iolite – Magnesium aluminum silicate is the chemical name of Iolite with a hardness of 7-7.5 on Mohs scale with orthorhombic structure and with 2.58 to 2.66 density. This stone is suitable for the third eye chakra. As we explained above how legendary adventurers used it while going on a journey so it’s considered to be a stone of strong vision. Insomnia, eye disorders and weak memory can be overcome by using this gemstone. Iolite hardness is good enough to be used in rings and can be worn on an everyday basis. Iolite is a perfect gemstone for a bracelet center stone, pendant and broach. Because of its royal color, this stone is used in many accessories of men like cuff-links, tie-tacks and as a center bow stone because of its nice blue color. Jewelry Designers have long searched for an affordable gem to complement the rich blues so prevalent in fashion, from denim to velvet. They found it in Iolite, an unusual gem that offers rich blue color and won’t break the bank. Named from the Greek “Ios”, or violet, Iolite at its best is a rich violet blue that might remind you of better-known gems like Tanzanite and Sapphire. Although it is still not well known, Iolite has a long history as stated. Navneet Gems has been manufacturing all types of Iolite gemstones and cabochons. We have more than 10,000 carats of Iolite cabochons in stock. We cut faceted stones small to big sizes on order as well. If you need small sizes like 1.5mm, 2mm and others then we also have that and supply to our customers. If you are looking for Iolite cabochons of top quality then we can personally make that piece for you because we have availability of raw material and we cut directly from rough for special requirements. Please send us an inquiry through mail so we can reply you quickly. To make conversation faster please mention sizes, approximate quantities, shapes and sizes and quality (Simply write A, AA or AAA). Use the Contact Us page for our email address or an easy Inquiry Form. For anything else, please let us know and we are ready to help you immediately.